I’m sure you’ve heard of the volcano eruption in Chile this last week – down at Chaiten, a massive eruption has devastated the towns of Chaiten and nearby Futaleufu – ash up to 12 inches deep covers much of Futaleufu. Geologists say the volcano hasn’t erupted in nearly 10 000 years. The volcano is still erupting, a week after the initial explosion, and wind is carrying the ash and dust east and over the town of Futaleufu. The poor little coastal town of Chaiten has been totally rocked, and Futaleufu is hurting – so far all but a few people have left town. A National Geographic vulcanologist has said this particular type or eruption is the worst kind, and could easily continue for months. 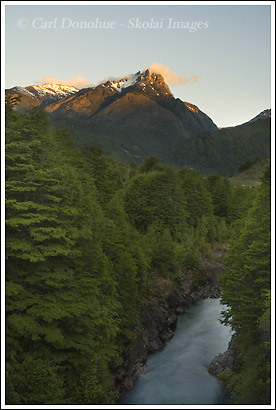 I have fond memories of my time in Futaleufu, and am sorry to hear of the hardship those good people presently endure. At present, the people are in need of some assistance – food and water are being chartered in, and some help is needed. If you have the time and some spare change, a donation would be greatly appreciated. You can go to this page set up by H2O Patagonia (a whitewater rafting company) and make a donation – that would be awesome. I spent 4 months here, Dec 2006-April 2007, and I can’t speak highly enough of the people there – wonderful, friendly, beautiful people. My friend Mitch, from H2O, is a great guy and definitely someone who will ensure any donation you can make will be put to good use, and not wasted. Please help out some wonderful people in their time of need, and give a little. And when all this settles down, head on down and see some of the most people and landscape you’ll ever see, in Central Patagonia, around Futaleufu. This photo is of a mountain called Las Tres Monjas, which translates in English as ‘The Three Nuns’ – a classic peak, catching the last ray’s of the day. The river here is the Rio Azul, which joins the Futaleufu about a mile downstream from where I took this photo. This entry was posted in Chile, Landscapes, News, Travel on May 14, 2008 by Carl D.
Although the eruption of a volcano can be an awesome sight, too many times it ends in tragedy & disruption of peoples lives. I hate to hear of this for these people. And there are so many other tragedies happening elsewhere, too. I know I will try to help.May not be much at the moment, but I’m sure every dollar helps!! Hope you’re doing well, Carl! Seen any bears out yet? That is really too bad. Thanks for sharing Carl, I wasn’t aware of the extend of the damage. I’m sure it’s an amazing spectacle, and I’ve seen some insane photos from there. But yes, it’s a struggle to deal with for those in the area, for sure. And you’re right, every little bit helps, thanks. Nope, no bears yet for me. Yeah, it’s kind of been untouched by the news here about the severity of the devastation for the people there – the media’s too distracted by inane items of glamor, usually. I’m doing a school project in geo n i wanted to do about this eruption…..
how long did the eruption last??? hey i knw it wz two years ago bt im doin a school project about the eruption and just wanted to know how long it lasted for ?